Born on 21 June 1986 life for this self-confessed adventurous fun-loving girl has been anything but dull. Born with one leg shorter than the other, as a result her right foot was amputated when she was eighteen months old. It wasn’t long before Kathleen mastered the art of life with an artificial leg and growing up in a very sporty family saw Kathleen playing many sports with an interest for basketball. Her mentors, Paralympians Don Elgin and Tim Matthews, convinced her to try Paralympic sport. A turning point that would later see her travel to the other side of the world to pursue her passion. In 2000 Kathleen lead the way in fund raising to ensure a group of young children with missing limbs could go to Sydney to witness the Paralympics, her generous nature has her to this day heavily involved with creating opportunities for those less fortunate. 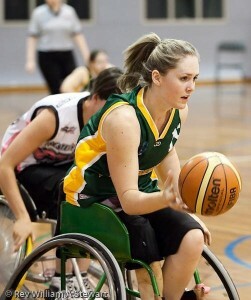 Her wheelchair basketball career started with the Victorian Women’s Wheelchair Basketball Team in 2001, the following year her talent was evident and she became a member of the Victorian Women’s Wheelchair Basketball Team. There was no turning back in 2003, Kathleen took the next step in her exciting career when she became part of the Australian Development Team, and participated in her first overseas tournament, in New Zealand. Representing Australia for the first time in the senior team followed when she played in the Tri-Nation Tournament in the United States later that year. Following Kathleen’s High school graduation in 2004, she received an offer of a half-scholarship to University of Illinois, where she was coached by Mike Frogley. In 2006 & 2007 she was on scholarship with the Victorian Institute of Sport. Kathleen went on to win three US National Championships with the University of Illinois team, in 2006, 2007 and 2008. In one game she scored a career high of 42 points. Recruited by Italian Men’s Professional League team Anmic Sassari for the 2010-11 season and by the reigning champions, Lottomatica Elecom Roma, for the 2011-12 season. Away from the court Kathleen has studied speech and hearing at the University of Illinois and with team mate Leanne Del Toso established the Set No Limits foundation, the foundation aims to motivate young people with disabilities by showing them what they can do in sport and life. Kathleen O’Kelly-Kennedy is a lady on a mission, incredible passion for helping others and is testament to the power of resilience, there is little doubt why Kathleen is in demand as a speaker at schools all over WA. “Kathleen is a wonderful young woman, full of enthusiasm and a community spirit that is rare in one so young. Kathleen has worked collaboratively with City of Melbourne on a number of events, notably the Australian National Parking Conference, as a consultant on production of a suite of important in-house training videos on people living with disabilities, and organising a range of disability awareness events. Kathleen is an amazingly motivating person – her infectious smile and willingness to directly engage with people makes her a real winner. She will be working with City of Melbourne around several large-scale conferences in 2013-14. Her knowledge about people living with disabilities and capacity for sharing her own personal experiences are guaranteed to have people listening enthralled and thoroughly enjoying the journey Kathleen will take them on.”. “Kathleen has been a welcome and delightful speaker at the Goolagong National Development Camp on two occasions over the past 5 years. Delivered with bags of personality, she enthrals her audience with her story which is delivered with humility, honesty and no little amount of humour. It’s an inspiring story that will touch everyone.”.